Safe Direction has successfully crash test validated RhinoStop Elite car park barrier to Type G compliance of AS/NZS 1170.1. making it the only modular off the shelf non W-Beam system to meet such a level. Unlike twin rail industrial W-Beam systems rated to this level, RhinoStop Elite looks great and adds an architectural feature to any car park. Conventional car park perimeter barriers are required to meet Type F compliance for a 30kN load acting at 0.5m above ground level – the basis of the load being a 1500kg vehicle travelling at 7 km/h. Type G compliance is for a 40kN load acting at 1.0m above ground level – the basis of the load being a heavier 2,000kg vehicle travelling at 7.0km/h at double the impact height for Type F.
RhinoStop Elite has passed impact testing at 20km/h (approx. three times the contemplated speed or 9 times the impact energy) with a 2,000kg vehicle impacting at a height 1.0m above ground. 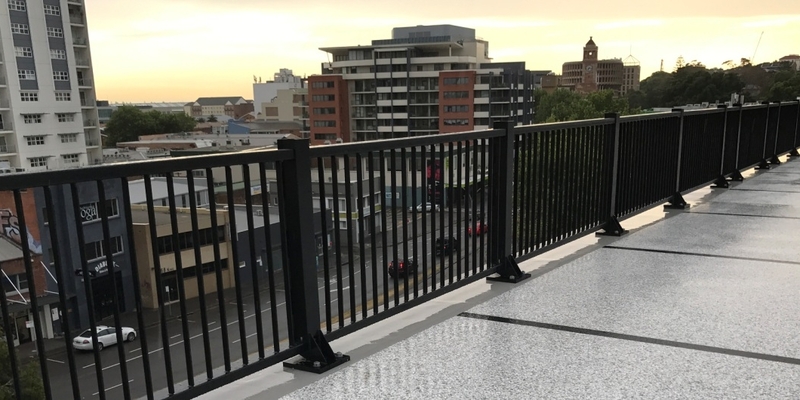 Testing was performed on a 150mm thin 32MPa suspended concrete slab with the barrier installed on edge to verify performance of the anchors (100mm embedment) in an often as constructed application. The tests revealed no damage to any anchor or the concrete substrate. Moreover, the test was conducted with a system comprising just three posts and the impact offset in consideration of a worse-case scenario. Crash testing the barrier immediate to the edge of a thin slab is of importance to validate that the anchors do not fail through a conical failure/breakout to the concrete edge. Crash test validating RhinoStop Elite with a 2,000 kg vehicle makes RhinoStop Elite the most appropriate modular car park barrier system for the Australian and New Zealand vehicle fleet which are now dominated by SUV and light truck (Hilux and Ranger, type) sales.